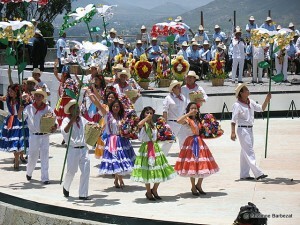 This year’s Guelaguetza festival will be held on July 23 and 30th. There are two shows each day, at 10 am and 5 pm. You can buy tickets online at Ticketmaster Mexico, or at the Oaxaca Secretary of Tourism office in Oaxaca at Avenida Juarez 703 (next to the Teatro Juarez, across from El Llano park). For the first section of the Auditorium (Palco A) tickets are 800 pesos, for the second section (Palco B) they’re 600 pesos. The third and fourth sections (Palcos C and D) are free, but people arrive several hours early to get good seats in the free sections. If you go: be sure to take the elements into account! The auditorium’s roof, which was inaugurated last year, was damaged by strong winds a few months ago, so there is now just one section in the middle which is roofed. So the middle seats in all sections will be the most sought-after. Expect sun for the morning show, and plan for rain for the afternoon show (it may not rain, but this is rainy season, so it’s best to be prepared!). The selection of the Goddess Centeotl will be held on Friday, July 13th in El Pañuelito, the little park beside Santo Domingo church, and the inauguration of the festivities will take place on the same day in the Macedonio Alcalá theater at 7 pm. A parade of the Guelaguetza delegations will be held on July 21 and 28 at 6 pm through the streets of the historical center. A mezcal fair will be held from July 20 to 31 in the El Llano park, and a tejate fair will be held on July 25 and 26 in the Plaza de la Danza, near La Soledad church. The Festival of the Seven Moles will be held from July 19 to 31. Donají: La Leyenda, a musical and dance performance relating the legend of the Zapotec Princess Donají will be presented in the Guelaguetza Auditorium on July 22nd and 29 at 8:30 pm. Tickets are 100 pesos for the first two sections, free for the other sections.